It's difficult to rate a nonfiction book when it deals with a subject in which you are a novice. As a beginner to this subject, how can I rate the content in regards to its veracity? Well, I cannot. Nor can I comment on the depth of Copleston's commentary. 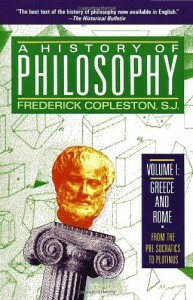 I can say, however, that this book covered a lot of ground in the realm of Greek thought, and was highly readable. I won't know to a certainty whether Copleston misled me or not until I read the works he commented on, but I have a feeling my time with this volume was well spent.